Rosemary Joseffa Glaser died Friday, January 25, 2019 at her home in Ponca City, OK. She was born on December 12, 1950 in Ponca City to August L. and Rosella M. Glaser. She was the fifth of seven children. She attended St. Mary’s Catholic School until the twelfth grade, when she attended and graduated from the newly opened Unity High School at the Marland Mansion. Upon her graduation, she attended St. Mary’s College in Leavenworth, KS where she received her degree in Library Science and Education. She then taught 7th and 8th graders at St. Xavier’s Catholic School in Junction City, KS. She also coached cheerleading and loved working up new routines for the students to perform at their games. She taught there until she moved back to Ponca City in 1983 to live with her mother after her father’s death. For some years, she cared for several children at her home including her great-nephew and great-niece, Colton and Jessica Bowker. She was employed as a librarian at St. Mary’s Catholic School in Ponca City in 2004 and was still employed there at the time of her death. She enjoyed introducing the children to the joys of reading and loved watching many of her students grow from small children to strong, sure young adults. She also ran the Pot o’Gold prize booth at St. Mary’s Fall Fest for many years. Her friendship with Jeanne and Jerry Brace resulted in a yearly fund raiser, “St. Mary’s Night at Brace Books” which has in hundreds of books being donated to the school library. She was active at school serving on and chairing committees for Fall Fest, Catholic School Week, Red Ribbon Week and Dr. Seuss Week. 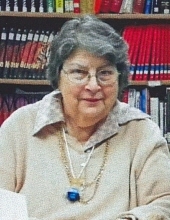 She was also a member of the committee that created the St. Mary’s School Cookbook. Rosemary was a member of St. Mary’s Catholic Church all her life. She delighted in visiting with all her family and especially spending time with the nieces, nephews, great-nieces and great-nephews. She enjoyed helping with homework and term papers and helped several young relatives with homework from grade school through college. Rosemary enjoyed reading, cooking, gardening, sewing and embroidery. She loved to do Soduku puzzles and creating beautiful colored pencil drawings. She was working on designing a quilt for one of her great nephews. She is preceded in death by her parents, August L. and Rosella M. Glaser and two nieces, Jonean Glaser and Jessica Giesler. She leaves behind her siblings and their spouses: Joseph F. and Jean Glaser, Helen Glaser, Tom and Kandy Glaser, Don and Susie Glaser, Jeanne Glaser and Julia Jackson as well as many nieces, nephews, great-nieces and great-nephews. She was part of a very large, loving family spread over the United States and will be greatly missed. There will be a Rosary service on Wednesday, January 30, 2019 at 6 p.m. at Trout Funeral Home Chapel. Her Mass of Christian Burial will be on Thursday, January 31, 2019 at 10 a.m. at St. Mary’s Catholic Church. Rosemary will be laid to rest in St. Mary’s Catholic Cemetery following the service. To send flowers or a remembrance gift to the family of Rosemary Glaser, please visit our Tribute Store. "Email Address" would like to share the life celebration of Rosemary Glaser. Click on the "link" to go to share a favorite memory or leave a condolence message for the family.